No homage to Thelonious Monk can be easy. Mr. Monk’s angular, idiosyncratic music is impossible to get away from and even more impossible – if such a thing is possible – copy. There have been, to my knowledge only two notable exceptions: the first is Heiner Stadler’s great record Tribute to Monk and Bird (Tomato Records, 1974) and Chick Corea’s Trio Music (ECM, 1981). The reason why those records made the cut, in my considered opinion was because – as Thelonious Monk once instructed to his sidemen – “play yourself” and both Mr. Stadler and Chick Corea did just that. Moreover both those records, especially Heiner Stadler’s, were visionary in that they imagined what Thelonious Monk music might have sounded were it to be interpreted today. Unlike re-imagining Beethoven today, the diacritical remarks on the score of his music would dictate how the music was to be played. But doing the same for Thelonious Monk’s music would require a true leap of faith. This is exactly what Frank Carlberg and Leo Genovese have done for Thelonious Monk’s music on Shadows and Reflections. I would argue that this “Monk music” and “music about Monk” sets a new benchmark not only for musicians seeking to extrapolate on The Great One but for musicians seeking to make contemporary music per se. I admit that’s a bold statement to make, but this music is a bold statement itself, invented in intellectual and artistic energies that very few recordings have today. Much of this has to do with the fact that Frank Carlberg and Leo Genovese are two exceptionally gifted musicians and extraordinary virtuosos, who not only have an impressive repertoire to back it up, but also whose music is ignited by that stroke of genius that few musicians can boast of. The music of Thelonious Monk occupies the bluest part of the artistic flame. It has endless wit, variation and elegance, and is the classic and original music of the 20th and 21st Centuries. These musicians have an intimate understanding of this. 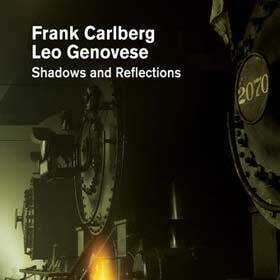 On Shadows and Reflections both Frank Carlberg and Leo Genovese’s playing yields compelling variety and prismatic possibilities not only in the “Monk music” but also in Mr. Carlberg’s original compositions written for and/or dedicated to Thelonious Monk. Moreover the music – all the music – is rendered by the two keyboardists as it was natural territory. Ornamentation tends to be taut rather than pliant and its expressive power is explodes all known boundaries of modern interpretations of Mr. Monk’s music. Listen to any of Mr. Monk’s titles – especially “Epistrophy” and you will hear what I mean. Both Frank Carlberg and Leo Genovese are risk-takers, far more dramatic than most musicians and expressive as well. Both musicians’ strength emerges where one wants simplicity, where the music needs to unfold directly and without too much interpretative intrusion. Even in sharply rhythmic music like the Thelonious Monk composition “Hornin’ In” and in Mr. Carlberg’s own composition “Merry-Go-Round-No-More” the two produce an aristocratic smoothness that is arguably better suited to both composers’ works than the sharp snaps and rhythmic punch of other interpreters. And both Mr. Carlberg and Mr. Genovese knit together the music into a close composed weave, rather than something seemingly improvised and fitfully delivered. Best of all, there are two compelling reasons for owning this record: it is endlessly entertaining and vibrant music; and it is meticulously performed and recorded. 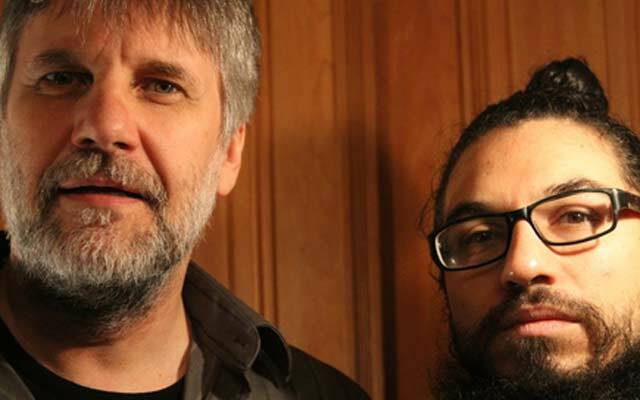 So lovers of Thelonious Monk, Frank Carlberg and Leo Genovese should not be without one.